visit https://www.theoutcallspa.com or call 8782-0561 to book an appointment. The brainchild of (left) Amber Chong, 36, and (right) Stelaa Tan, 35. Outcall Spa is a mobile massage service (they don’t have a brick and mortar stone) but it’s as real home spa as it gets. They’ll go anywhere with four walls, a roof and enough space for a single sized portable bed.It goes the extra mile by making your adobe look as close to a real spa as possible, and deliver a “luxurious and relaxing experience,” according to Amber. This includes bringing alone a portable music player to play relaxing spa music, a professional massage bed set up with embroidered towels and a range of aromatherapy scents and massage oils from France, Korea and Australia to choose from. skills and service quality before hiring them. Simply call the appointment hotline (8782-0561) or send a message via the Outcall Spa website and you’ll receive a confirmation via whatsapp or email once the booking is confirmed. The Spa Offers seven different massages, including couple massage, deep tissue massage for stress related tension, pre-natal massage to ease back aches and a traditional Javanese post-natal massage. If you want a massage pronto, you can actually book a service for an hour later, depending on the therapist’s availability. The spa also caters to hen’s night parties or girly get-togethers, and couple massages. Prices start from $168 for 90min. Co-founder Amber, who has a day job in businesss development, had stepped on a wasp one morning as she was preparing to leave the house for a massage. “I couldn’t leave the house as my foot had swelled up, and thus tried to go online to search for a reputable therapist who would come to my house instead, but it was a fruitless search”, says Amber. 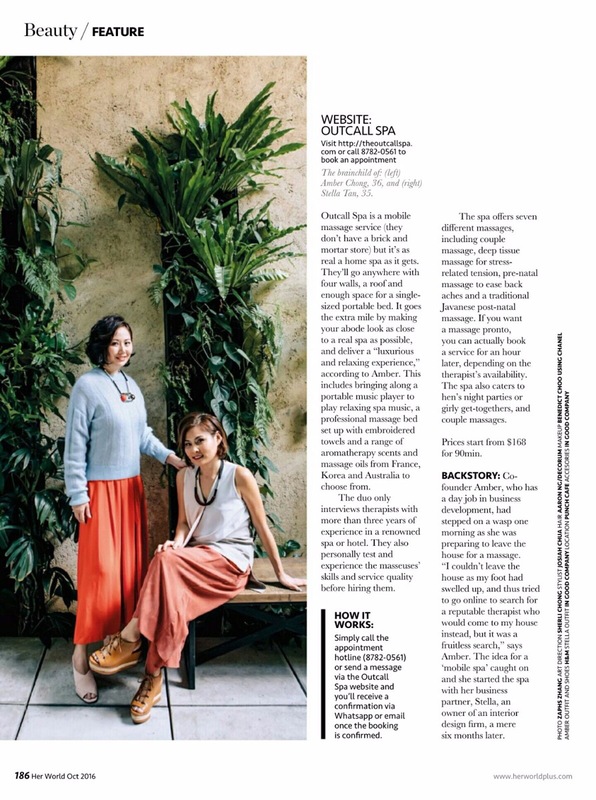 The idea for a ‘mobile-spa’ caught on and she started the spa with her business partner, Stella, an owner of an interior design firm, a mere six months later.